It was 100 years in the making. 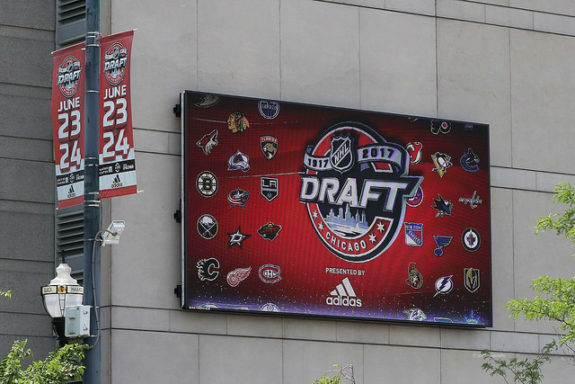 Chicago finally had the chance to host an NHL draft. The vibe around the city was electric. The weather was perfect. The two-day event drew an NHL-record 47,514 fans, including both inside the United Center and outdoors at the fan fest. Given the event’s resounding success, the League probably won’t wait another 100 years to bring the draft back to the Windy City. On the draft floor, the Chicago Blackhawks executed their strategy. It was one that I called for in previous columns. Draft defensemen and centers. The organization needs depth at those positions. Apparently, the Blackhawks’ front office shared that sentiment. Chicago finished the weekend making nine total selections: five defensemen, two centers, a left wing and a right wing. In today’s NHL, there is an increasing emphasis on speed and pace, particularly on the back end. 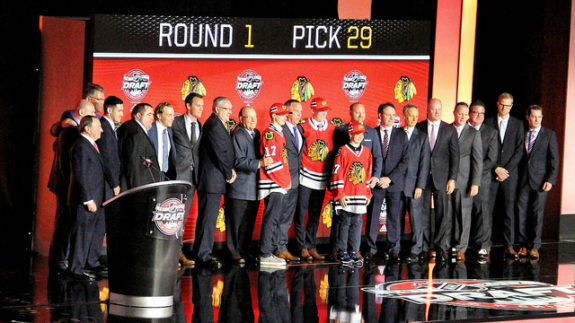 The Blackhawks’ general manager Stan Bowman and vice president of amateur scouting Mark Kelley made it known through their draft selections that they were looking to add that type of skill set to the organization. I prefer to stay out of the business of grading drafts less than 48 hours after they’re complete. In reality, you need five to seven years to accurately grade an NHL draft. If you think back on Chicago’s recent draft classes, the jury is still out on the 2013 and each subsequent draft. Players have to be given time to develop at the junior, minor and collegiate levels and transition to the NHL before a fair assessment can be made. While grading won’t be a part of this discussion, let’s take a peak at the players that comprised Chicago’s defense-laden draft class. Chicago traded down three spots to 29th overall, received the 70th overall pick from the Dallas Stars and still got their man in Henri Jokiharju. With a bit of foresight and probably some dumb luck, I chose Jokiharju for the Blackhawks in our THW Mock Draft. When you watch his film, he just looks like the kind of defenseman Chicago wants. At 5’11” and 165 pounds, he’s not big in stature. But the Finnish defender has high-end potential. According to Future Considerations, he’s quick, confident moving the puck, has good footwork and is calm making plays under duress. He’ll bring the puck up the ice with some pace and create offensive opportunities. He doesn’t have overpowering strength or the hardest shot, but he’s not afraid to battle for loose pucks. Jokiharju has a nice wrist shot to get the puck on net and create rebounds. At 5’11” and 170 pounds, Mitchell’s measureables are similar to Jokiharju’s. Ranked anywhere from the 35th to 83rd best prospect depending on the publication, Mitchell’s selection late in the second round aligned with the industry’s expectation. The Canadian defender is believed to have top-four upside. He can play a two-way game, moves the puck well, makes good reads and decisions, plays a responsible defensive game and can be physical despite his size. Mitchell is slated to join Chicago’s 2016 sixth-round pick Blake Hillman at the University of Denver for the 2017-18 season. If spelling his name doesn’t trip you up, pronouncing it could surely give you a run for your money. If Altybarmakyan ever solidifies his spot on an NHL roster, his arrival is sure to come with a nickname. Alty has a nice ring to it. By the 90th pick in the third round, I was clamoring for the Blackhawks to take center Scott Reedy from the US National Team Development Program. Despite an industry sentiment that Reedy ranked anywhere from the 40th to 77th best prospect in this draft, he eventually was drafted 102nd overall by the San Jose Sharks. 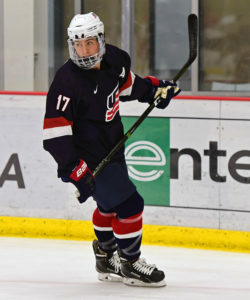 Chicago opted for a different USNTDP center, and that was Evan Barratt. Barratt was expected to be a third- or fourth-round pick. He has decent size at 6’0″ and 187 pounds. While he has some skill, the quality that stands out about Barratt is his compete level. He has been deemed to be a high-effort, high-character individual. Barratt is slated to play at Penn State during the 2017-18 season. The Blackhawks took five additional players in the later rounds of the draft. Those include Tim Soderlund (Swedish C/LW) and Roope Laavainen (Finnish D) in the fourth round, Parker Foo (AJHL LW) and Jakub Galvas (Czech D) in the fifth round and Josh Ess (D) from Lakeville South High School in Minnesota with their final pick in the seventh round. The two late-round picks that stand out to me are Parker Foo and Josh Ess. Foo, taken with the 144th pick, was ranked the 102nd best prospect by Hockeyprospect.com in this year’s draft. He had a productive year with the Brooks Bandits, tallying 34 goals and 32 assists in 60 regular season games. He added another 10 goals and 10 assists in 13 playoff games. He is slated to go to Union College for the 2017-18 season, a program that has had recent success under head coach Rick Bennett. Foo should have a great opportunity to develop his game at the collegiate level. The same can be said for Josh Ess, who is scheduled to play hockey for the University of Wisconsin next year. The head coach of Wisconsin? Tony Granato, the brother of the Blackhawks’ newly-hired assistant coach Don Granato. At 5’11” and 183 pounds, he has some decent size for a player moving from high school to college. He is touted as a strong skater and instinctual player.